It might be because I grew up in the midwest, but I have a love of ranch. Give me options to dunk fries in and I’ll almost always choose ranch. So it’s no surprised that I would come up with a ranch spinach pizza recipe. Typically these types of pizzas contain chicken but with the flavors from the ranch and overloading it with spinach, it doesn’t need the meat. I’ll usually make a large batch of the ranch to use throughout the week (and store it in my favorite jars), which makes this pizza even easier! In a small bowl, stir together all ingredients for the ranch dressing except for the buttermilk. Taste and adjust the ranch flavors if need be. Stir in buttermilk, 1 tablespoon at a time, as needed to thin out the ranch if desired. Once your dough has double in size, preheat your oven to 500˚. Return to your dough and punch it down. Let rise for 20 more minutes. Roll the dough out onto a surface covered in cornmeal (I used a large wood cutting board put some of you may have a pizza peel.) Roll it out to the size of your pizza stone. Spread enough ranch over pizza to cover (you may not use all). Cut onion into thin slices and layer over ranch, followed by the spinach. Top pizza with enough cheese to cover most of the spinach. Slide pizza onto stone and let bake until crust and mozzarella is golden brown, 12-15 minutes. Let sit for a few minutes before slicing. *I often cheat with buttermilk because I rarely have it in my house. I’ll combine 1/4 cup milk with a couple dashes of apple cider vinegar or lemon juice and let sit for a minute before using. Also- I will usually double the ranch recipe and use to dip the pizza in (the ranch flavor isn’t heavy on the baked pizza. And if you have leftover ranch- use for salads! 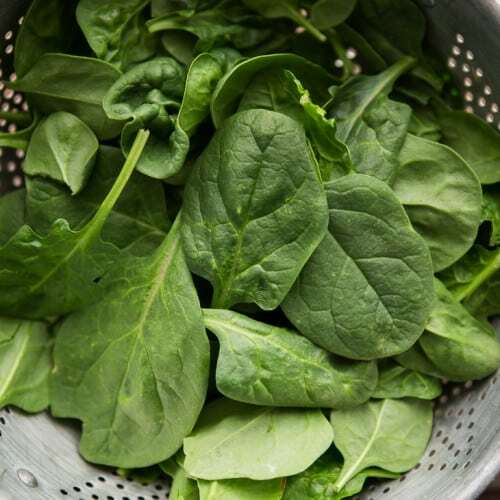 Greens: Kale and chard make excellent substitutes for the spinach. The kale, if left without cheese on top, will crisp up into something akin to kale chips. Base: If you’re not looking to use the ranch, sauté garlic in a few tablespoons of olive oil, just enough to warm the garlic. Use this garlic oil in place of the ranch (and/or add a few of the herbs). Cheese: The mozzarella is fairly plain in terms of flavor- try adding smoked mozzarella, gouda, or a few sprinkles of goat cheese. i agree with you wholeheartedly. i would rather stuff my face with stir-fried veggies all day everyday and maybe eat a little bit of meat every once in a while, than chug protein shakes (what the hell are those things made out of anyway?). key thing is to eat well and move… i think you’re on the right track. i listen to trainers’ workout ideas, but screw their thoughts on diet and food. i sometimes believe they just want to sell their icky products. LOL! There are protein powders that are raw, healthy, and made of real food and not strange chemicals and ingredients- but I agree that we all need to figure out what’s best and healthy for us. Good point! I’ve tried a few but never found one I really liked. It’s all up to the individual! I love this- you define healthy for yourself; that doesn’t mean that eating ho ho’s all day every day is healthy, but it does mean that I can eat flour and wheat and still be healthy. Also, it means I can be a marathon runner and choose not to eat meat and maintain a healthy lifestyle and weight. Stupid food bullies. Ha I love what you said… stupid food bullies. That sums it up right in those three words. This looks incredible!! Amazing! I want to make it for my family tonight! you ground your own flour?! tell me more!!!! how? what?? I agree with Chelsea, I would tell the trainer you are there for fitness tips not nutrition advice:) I workout regularly and the recipes I have tried of yours are healthy, real food. Don’t give up at the gym, you have the eating down just add the weights and it will help! I do try to limit my carbs after lunch though. I can’t stand trainers at all, especially after all the medical training and experience I have running marathons. Sometimes the things I hear them telling their clients is blatantly wrong and it drives me crazy. I say go with your instinct and what has been working for you…because honestly personal trainers don’t have very much training or extra schooling. Yum! It looks delicious for sure. I used to be more judgmental about food, but I’ve come to learn that most people either know what makes them feel good or they don’t care. Either way, it’s none of my business unless they’re asking for help! I think what works best health and fitness-wise varies from person to person. I also think if you deprive yourself you’re setting yourself up for failure. I have a similar outlook to you when it comes to eating and what food I consider to be “healthy”. I recently started doing P90x and it’s the first workout routine I’ve ever done that I really enjoy. It’s hard and it’s a commitment, but I can tell I’m getting stronger and I have better endurance. Suddenly that’s become more important than just looking good. Feeling physically stronger is more of a confidence booster than I ever would have imagined. If you’ve never tried it you should look into it, I’m a firm believer in weight training now! I agree with you 100%! Healthy means cooking REAL food, not the processed stuff, and everyone needs to find their own perfect balance. 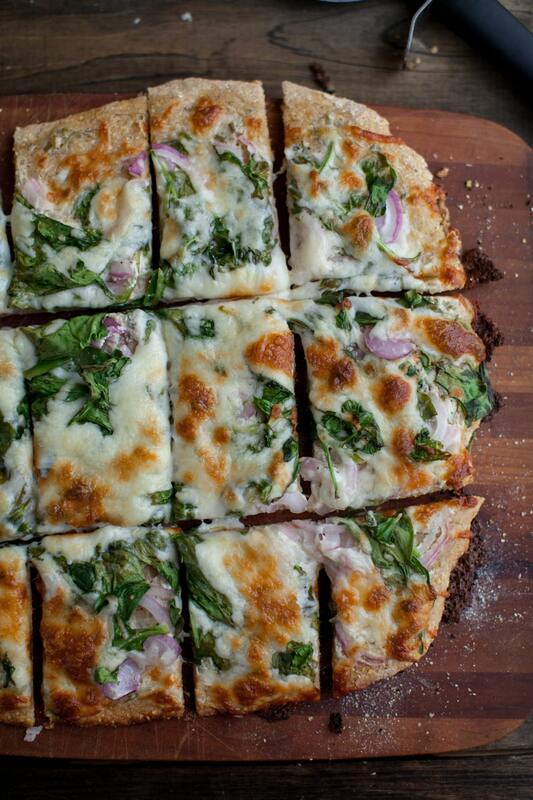 Your spinach pizza looks incredible and I can’t wait to give it a try. I had pizza for lunch, but I want this version so much right now! I love the ranch recipe and the fact that it’s egg free. I also had one of those consultations when I joined a gym: “You’re a vegetarian? What do you eat for protein?” I just rattled off my usual diet and that shut them up really quick – somehow people don’t realize that vegetarians usually know what they’re doing. There are some things that no one should deprive themselves of, and for me that’s cheese and beer. They may not be the best for me, but I try to make up for it with my other food choices. Your pizza looks delicious. I’m intimidated to make the crust from scratch, but I may just have to try it. The ranch sauce sounds insanely delicious!! LOVE this! Beautiful pizza! And perfect solution to use up my spinach. It doesn’t get any better than pizza, does it? OMG! The same exact thing just happened to me on Tuesday! I went to the Y for my ‘orientation’ with the personal trainer and she told me I couldn’t be getting enough protein to begin weight training. I explained to her that my daughter is an ACE certified personal trainer, Nutritionist and Physician’s assistant and is also VEGAN! She just smiled and said that I must not be following it too closely since I was obviously overweight and not in too good shape. My hubby and I started the new lifestyle six months ago and have both lost over 20 pounds. We feel great. Thank you for your blog and your wonderful recipes. This pizza looks so good! And WAY healthier than the delivery kind with the fake ranch dressing on the side. Some trainers drive me nuts…sitting there chugging their protein shakes. As an RD, I know most people do not need half the amount of protein they think they do. Trainers barely have any education in nutrition and what they do get is a short bit from their personal training certificate. Not really all that qualified to provide nutrition advice! I hate when they act like they’re better than you… Pizza looks too good to be true! Hi Ella – dont despair with Personal Trainers – there are some good ones out there. I am a mostly vegan personal trainer and as far as nutrition goes believe that there is definitely more than one way to eat healthy. Its about finding a eating plan that works for the individual both emotionally, physically and ethically. Too many trainers have a one size suits all approach instead of assessing and listening to their clients and working out a individualised program – after all it is meant to be PERSONAL training. Sorry you had a bad experience with one. Look for a trainer with lots of experience and ask lots of questions of them to get an understanding of how they work. Unfortunately the standard of education of a personal training qualification is very basic so you its important to find ones that have continued with further study. There are some very good ones out there. Um, wow. This pizza needs to be my dinner right now!!! I just love this. I’ve been craving pizza for days! These photos are driving me crazy! Totally, totally agree with you. I’ve been watching what I eat more and more recently and I know how eating (low calorie) crap makes me feel. And it’s not fun. I’d much rather eat a homemade pizza like this with leafy greens and proper, real cheese than some fake rubbish. Straight up. Real food is where it’s at. So much more going on in that real pizza, that real steak, those real cookies than in any chemically concocted protein shake or diet bar. Blech. Sounds like you encountered a bad trainer. I myself am a trainer and cooking coach at a wellness center. I am in the process of pursuing a nutritional certification for BASIC eating (nothing specialized) and I agree that some of us are way too stuck in “you must do it my way” approach. Let me tell you something, I’ve seen far more success with a moderation diet than with an “all or nothing” approach. I myself use refined cane sugar to make a good cookie, I am not a vegetarian but I can screw up too and overdo the carbs and not get enough protein. Next time you get a trainer that wants to tell you how to eat, ask them how they know and what NUTRITIONAL certification they took to give you advice. Trainers can give you suggestions but should not be giving you nutritional advice unless they have some sort of certification under their belts. PS – In my opinion, your recipe is right on point. Just keep your ingredients clean and minimally processed and it sounds like a damn good pizza! Hi Erin! First, I would like you to know that you inspire me. Second, I made this pizza tonight. And it was SO good. So, so good. I will definitely make it again. Thank you so much for sharing with us both yourself and your recipes. I used the crust portion of the recipe last night (with different toppings) and it was delicious! It has a great hint of sweet from the honey, I may add a tad more salt next time, but otherwise awesome! I might do another variations of it tonite! I am overweight myself, so when I got my email of “thanks for being a member now for one year” from my gym, that entitled me to a free 60 minute session wish a personal trainer I turned it down. I like you had gone before to the introductory session, and they just want to tell you everything they’ve been taught, and I can’t help but feel and to some part know it’s just to try to sell you on more product and hype. When it boils down to it their own ideas of healthy are disordered. Is working out four to five hours a day, drinking massive amounts of protein, creatine, taking every supplement under the sun, suppressing your appetite, living without complex carbohydrates (from vegetables), which we’re really supposed to have, really call that healthy? They would condone you living your life out of a box. I have been trying to do this to years and just gaining weight and becoming more miserable. Thank-you very much for sharing this recipe and thank-you even more for sharing your feelings about the personal trainer and your attitude to food/cooking/living: I wholeheartedly agree!!! Protein is not going to help you lose weight, cutting calories is how people lose weight. You can be the healthiest eater in the world and be over weight if you’re consuming more calories than you’re burning; you can also be the unhealthiest eater in the world and be thin as long as you’re not consuming more calories than are needed to maintain weight. I’m in that category; I’m very unhealthy because I consume refined and high fat foods (Outback steakhouse Aussie Fries are amazing! ), but I’m still a healthy weight for my size (110 lbs at 5’0″) because I don’t go over my daily calorie limit. I look good (people ask if I’m a dancer or gymnast) but I don’t FEEL good (tired all the time, frequent headaches, unable to work out, anemic, etc). How you feel is the most important thing, you might feel like you’re getting to be a little overweight, but I bet you’re healthier than a lot of the thin people who eat like cardiovascular disease is a myth, and that is what’s important. Take it from me, being healthy is better than just looking healthy (that’s why I’m on this site). How does the recipe change if I use alternative flours? I have spelt and quinoa flour on hand, can i use either of these? You could try it with spelt but the quinoa flour wouldn’t be too terribly useful. Spelt has a bit of gluten but the crust will probably come out a bit more dense than if you were using regular flour.